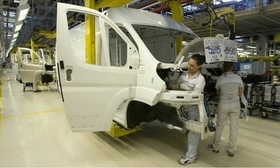 Earlier this year, PSA Group and Fiat Chrysler Automobiles extended their agreement to build large vans at the Sevelsud factory in Italy through 2023. PSA Group approached Fiat Chrysler Automobiles this year about combining the two companies, but the Italian-American automaker rebuffed the overture, The Wall Street Journal reported, citing people familiar with the matter. Executives at the two companies are no longer talking, according to the report. FCA executives don't like the idea because it would increase exposure to Europe's mature market, while the Agnelli family, with a controlling stake, isn't interested in a transaction financed with PSA stock, the newspaper reported. A PSA offer would likely need to use equity for a transaction to keep debt from ballooning, since the automaker hasn't yet digested its acquisition of General Motors' European business. FCA CEO Mike Manley has said he's not opposed to a deal that would make the company stronger. "I want to find areas where cooperation — whether it is partnerships, whether it's joint ventures or whether it is deeper levels of equity cooperation that makes sense for us and whoever that is — [will] give better vehicles to our customers and a better return to our shareholders," Manley told reporters at the Geneva auto show this month. "I'm very open to it." A combination of FCA and PSA, "from a volume perspective, would make sense," Richard Hilgert, senior equity analyst at Morningstar Inc., said this month. Together, they would make almost 9 million vehicles a year, giving them the heft to compete with Volkswagen, Toyota Motor Corp. and the Renault-Nissan-Mitsubishi alliance in a way that neither can on its own, he said. This is particularly crucial in the small-car segments both are known for in Europe and South America. And for PSA's Peugeot brand, planning a return to North America in 2026, Hilgert said FCA's U.S. retail network "would give them an opportunity to pitch to an established set of dealers." Jamie Butters contributed to this report.